Ferris Bueller was right --- life does move fast. 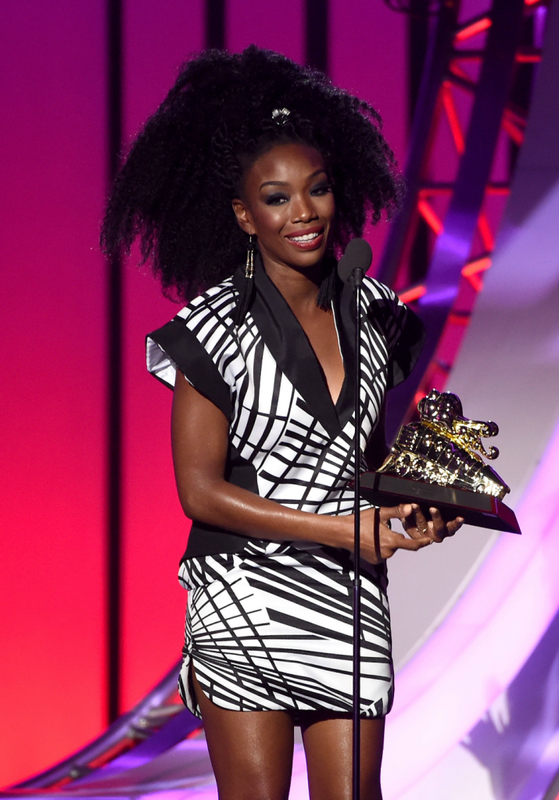 So fast that I missed how many classic and memorable bops Brandy had, but I was warmly reminded of such facts when Brandy took the stage at the 2016 Soul Train Awards to perform a medley of her most notable hits, this after receiving the richly deserved Lady of Soul honor. For 9 glorious minutes, Brandy brought her soulful and influential catalog to life with performances of "Angel In Disguise", "Full Moon", "Baby", "Wanna Be Down" and a Kanye West-less, "Talk About Our Love". She even conjured Ma$e from 1998 so they could dust off their hit collaboration, "Top Of The World". As a bonus, some shade towards Monica was thrown into the mix during "Talk About Our Love" --- stirring the pot on what the Innanets have been detecting --- just in case the performance wasn't 1998 or petty enough for you. While the whole show, which was hosted by Erykah Badu, was a blast into the past of the 1990s, with Teddy Riley, Bobby Brown, and Dru Hill also taking the stage, future soul troopers Anderson Paak and Yuna carried the torch well with their performances, proving that even though the R&B and Soul landscape is limiting, it hasn't gone by the wayside.